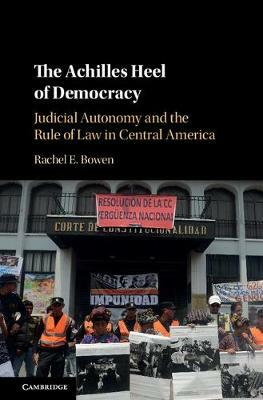 Featuring the first in-depth comparison of the judicial politics of five under-studied Central American countries, The Achilles Heel of Democracy offers a novel typology of 'judicial regime types' based on the political independence and societal autonomy of the judiciary. This book highlights the under-theorized influences on the justice system - criminals, activists, and other societal actors - and the ways that they intersect with more overtly political influences. Grounded in interviews with judges, lawyers, and activists, it presents the 'high politics' of constitutional conflicts in the context of national political conflicts as well as the 'low politics' of crime control and the operations of trial-level courts. The book begins in the violent and often authoritarian 1980s in Guatemala, El Salvador, Honduras, and Nicaragua, and spans through the tumultuous 2015 'Guatemalan Spring'; the evolution of Costa Rica's robust liberal judicial regime is traced from the 1950s.